The DKN 6 x 10kg standard weight plates are made from solid cast iron and feature a durable black finish. These robust, high quality weight plates are suitable for use with all standard 1” diameter bars and weigh 10kg (22lbs) each. 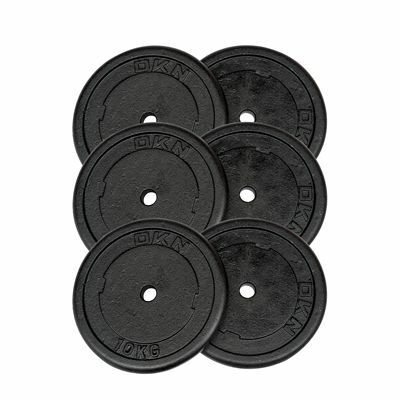 Plus, for quick and easy identification, they have a weight mark and DKN logo embossed on them and come in a pack of 6.
for submitting product information about DKN 6 x 10kg Cast Iron Standard Weight Plates We aim to answer all questions within 2-3 days. for submitting product information about DKN 6 x 10kg Cast Iron Standard Weight Plates. We aim to answer all questions within 2-3 days. If you provided your name and email address, we will email you as soon as the answer is published. for submitting product review about DKN 6 x 10kg Cast Iron Standard Weight Plates.